Church members and guests fellowship at the church launch. 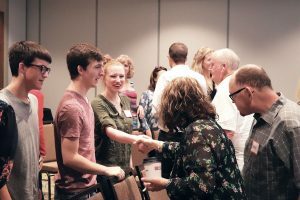 EDMOND—The church plant East Edmond Community Church officially launched with 81 people present Sept. 30, meeting in the Hilton Garden Inn and Edmond Convention Center, located at I-35 and Covell Road. The plant is sponsored by nearby Edmond, Waterloo Road; Edmond, First and the Church Planting Group of the Baptist General Convention of Oklahoma. The church plant team is led by two longtime friends, Ray Strauss and Aaron Day, son of the late Alan Day, former pastor of Edmond, First. Ray Strauss, left, prays with leaders of East Edmond Community. 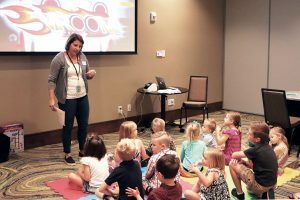 Church planter Christina Strauss leads children’s worship. Aaron Day, left, baptizes his daughter Adalyn with church planting pastor and longtime friend Ray Strauss. “Aaron’s dad baptized me, and 26 years later, the first baptism in our new church was Aaron’s daughter. 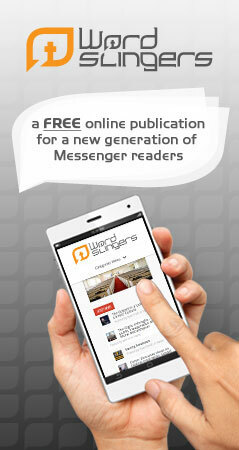 God had a really good plan in place long ago, and we have been blessed to see it unfold.” Strauss said.